February 2018 – Page 2 – Let's Go RVing! What a way to start a morning – with a 3 mile hike. We hiked the Bright Angel Trail, going down into the canyon 590 feet. Going down was a breeze. Coming back up was breathless literally! We went through the second tunnel before deciding that was far enough. As the magnet, sticker and possibly a shirt said in the General Store “Going down is optional. Coming up is mandatory.” We stopped only to take pictures of the very lovely view as we were going down. Fortunately we got a couple of pictures of the two of us, very unusual. Although there was a bit of ice initially that soon ended and the path was easy but all downhill meaning of course that the hike back to the trailhead was all uphill. We only stopped going down for pictures but going up – well, I lost track of how many times we stopped to gasp for breath! When we live at an altitude of 43 feet 7000+ tends to cause one to be short of breath. Neither Jerry nor I slept well last night, both a bit restless which we attributed to the high altitude. We’ve been in a high altitude before on this trip but our last stop was Needles, California which is 495 feet so a bit of a change in a day. Back to the hike – as we were going back up we had to take a number of breaks. I lost count after 5! When we had talked to the ranger earlier he had told us to be sure to look for the pictographs after the first tunnel. We looked on the way down but never saw them but we did see them on the way back. Amazing! I asked what kind of paint was used and was told it was probably from berries or things of that nature. Since they are sheltered from the rain that have remained for nearly 1100 years! The ranger also told us that we were part of only 7% who hiked down in the canyon. Can’t imagine not seeing all of that beauty from within the canyon. The Grand Canyon, Arizona and parts of Utah are in a severe drought now. The canyon has only had one big snow this year and usually they are covered with snow with temps much lower than we have seen. It has made travel for us nice in that we have not had a day of rain, snow or any bad weather. Because of that however we have not taken a day of rest the entire trip! After lunch we went back to the Visitor’s Center where we got our Passport book stamped. We then watched a wonderful movie about the Grand Canyon, “a vista that stretches out to the edge of the imagination”. Interesting facts about the canyon: The Colorado River is the prime shaper that chisels and carves out the canyon. 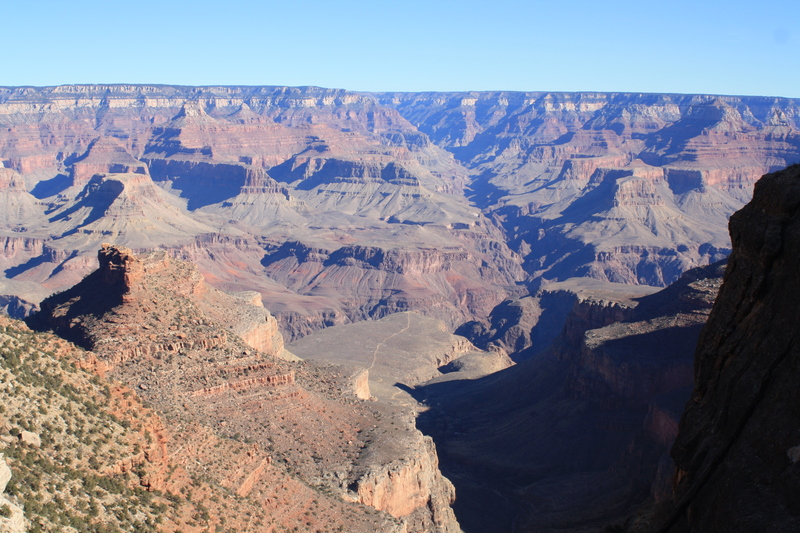 The canyon increases each year by the width of a sheet of paper. It is definitely a world of stone and light. 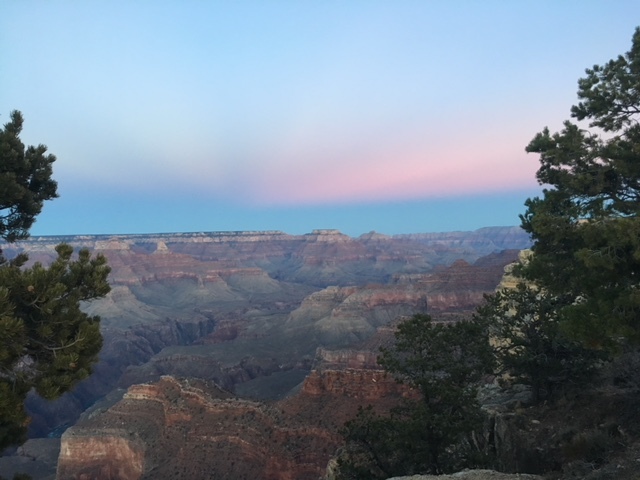 After the video we went back to Mather Point and again looked at the beautiful view, a world of stone and light, a world where the clouds cast part in shadow and suddenly bursts of light come through. The colors are indescribable and from Mather’s Point the reality of the depth of the canyon is daunting. We wandered down the Rim Trail for about an hour stopping occasionally to take pictures of the view or to take pictures of strangers while those same strangers then took ours. When we got to the first shuttle stop we decided to take it back to the Visitor’s Center where our car was parked. By that time we were both getting a bit tired. We returned to the coach for a little while before hastily heading back to Hopi Point for the sunset. There were many more people that tonight than last night I guess because it’s the week-end. There were fewer clouds in the sky but the sunset was still glorious. As we returned to the car we looked to the other side of the canyon and the sky was just as splendid if not more so. More examples of God’s beautiful creation. Oh my, what must heaven be? 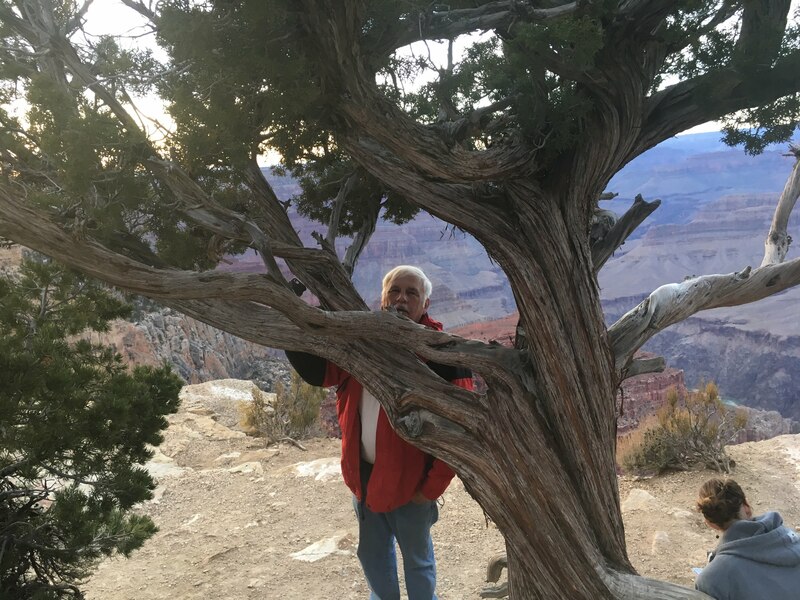 Operated by a concessionaire Trailer Village at Grand Canyon Village is a little pricey and naturally does not honor our America the Beautiful pass but we think the convenience is worth it. The other parks I looked at were in Williams which was an hour away. Being able to hike, then go back to the campground for lunch or just for a little rest before our next venture was worth the extra money we spent. We did have full hookup and the only negative was our Verizon was spotty at best. There were trees all around so I’m sure there would be good shade in the summer. As is often the case when we are traveling in “tourist mode” we don’t spend much time in the campground until we collapse at night, have a little dinner and hopefully get a good night’s sleep. We’ve been fortunate so far in that every campground we have stayed in has been extremely quiet at night lending itself to good rest. Guess that’s another advantage of traveling in January. We returned to the coach two tired folks but getting things ready to leave in the morning for … Um, not sure exactly where we’ll be staying. Will we be brave enough to try some BLM land? Will we stay in Flagstaff? Sedona? Will there be availability in a state park in Cottonwood? We don’t know but that’s one of the nice things about RVing. We’re pretty flexible! Love it when someone we don’t know comes by us blowing the horn and waving. Who was that? No clue. We pulled out of Needles KOA at 9:02 and literally bounced down Park Road. If there is a worse road anywhere around I surely don’t want to be on it. Suddenly a car passed us on a double yellow line blowing the horn and waving. Initially it didn’t dawn on us that something might be wrong. I guess it should have as it has happened before when the tow dolly and car caught on fire. Oh yes, apparently the severe bouncing on that horrible road caused the main center strap holding the bikes on to break and I guess we were about to lose a bike. Just before we got on the Interstate Jerry realized what was wrong so he pulled over and using every tool and strap we had he hopefully secured the bikes to the rack. The rest of the trip to Trailer Village RV at the Grand Canyon was uneventful thankfully. We stopped at a Love’s in Williams, got gas and had lunch. Before we left Kinston I had cooked some chicken, shredded it and then froze it so last night I was able to fix some good ‘ole home chicken salad and that’s what we had for lunch. 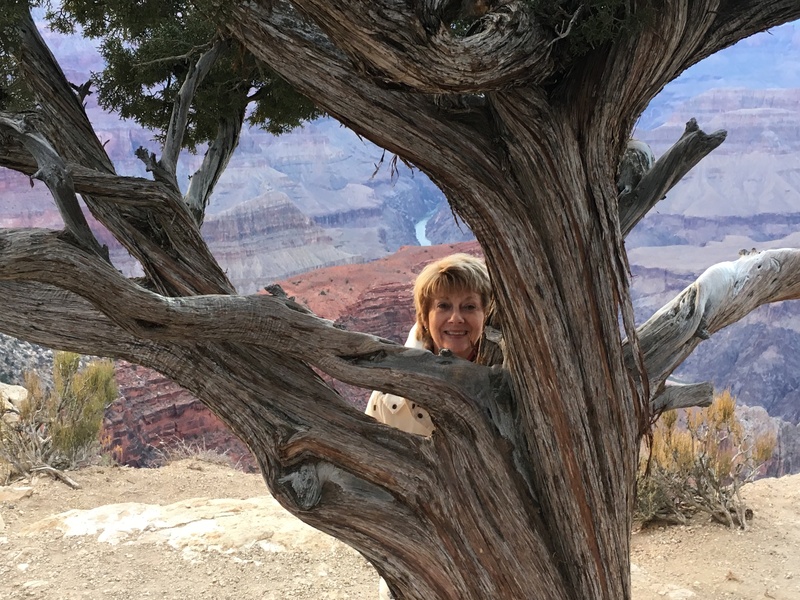 After a quick check in at the Grand Canyon using our America the Beautiful pass (for the park, not the campground) we headed to the campground. Check in was quick and easy and we had a full hookup pull through site. Yea! As soon as we got settled we headed out to the Visitor’s Center. Our first stop though was the General Store where they had everything from groceries to clothes to of course, magnets. We wandered around there for a good while just taking in everything. The parking lot at the Visitor’s Center was full but we were able to snag a place. I can’t imagine what it will look by spring when the busy season begins. 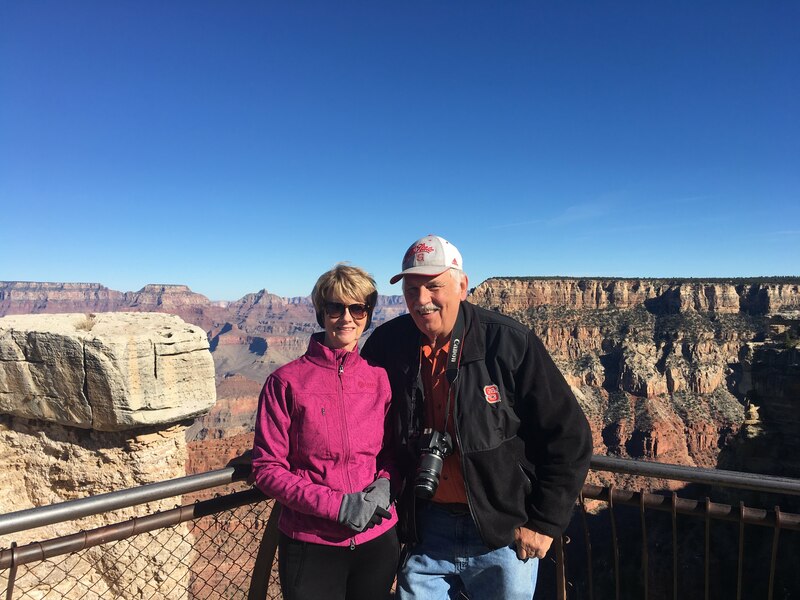 We talked with a ranger who gave us some ideas for hikes tomorrow but suggested we walk out to Mather Point where we could see all of the canyon. Wow, what a stunning view. The wind was blowing and it was pretty chilly and not having planned for that we didn’t even have coats so we didn’t linger. Perhaps a repeat visit tomorrow if we have time. 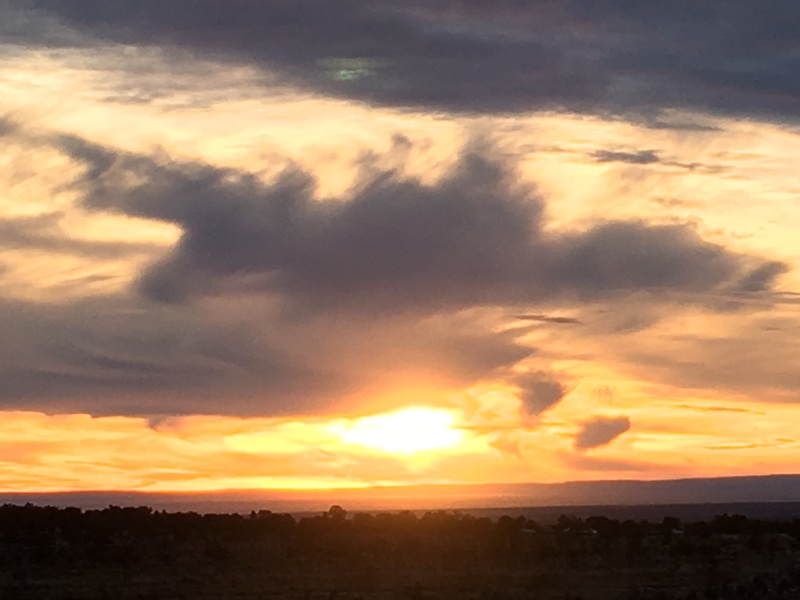 The ranger also suggested either a sunrise or a sunset at Hopi Point for the evening. Jerry didn’t think we had time to get there since we didn’t know exactly where we were going plus there is right much road construction with detours going on. We made it though. Fortunately both of us had left our heavy coats in the car so we were able to get out and view an unbelievable sunset – finally! There were a lot of people there but very little talking. The wind was rustling though the trees as the sun in all of its splendor begin to light up the sky with blues, yellow, golds, pinks, grays, lavenders, oranges and teals – what a splendid example of God painting the sky. Since it was so cold we didn’t linger long but since Jerry didn’t have his good camera we knew we’d be back tomorrow. When we were in Maine years ago I took a picture of Jerry peeking out from behind a tree. It was a great picture and for some reason we started getting “tree pictures” everywhere we went. Today we were able to get two, one of each of us!